No Tav activists were not expecting the police to expropriate until the following night, but they came in the morning, after an urgent order by the Prefect. On Monday 27th February they started to build the fences to enlarge the construction site, in spite of the 75.000 people demonstration that took place just two days before. Luca Abbà, farmer, No Tav activist since the beginning of the protest and owner of one of the newly expropriated plots, forced the police block and reached a power line pylon, climbing on it as he had already announced he would have done if the Tav building site wouldn’t have been stopped. Keeping in contact to a local militant radio by his mobile and shouting to the policemen, he told that he was ready to touch the high-tension cable, but this didn’t stop the police to run after him with climber agents. Abbà kept on climbing until he touched the cable (a witnesses say by the transmitter antenna) and fell down, struck by electricity, from an height of more than 10 meters. The same witness – Mimmo Bruno, a No Tav activist – told to “Sky Tg 24 News” that a police climber was trying to grab Abbà’s ankles just before he touched the cable and fell. Police has released a video where Abbà’s fall is showed, but just in its horrendous ending, with Luca hitting the stone and cement ground. The video is cut so that we can’t see him touching the cable and starting to fall. Many accuse the police of trying to hide its own direct blame in the event. A local radio collected witnesses’ statements telling that Police questioned and took the witnesses’ evidences about the moment of Luca’s fall from the pylon; but were then told those testimony had no legal relevance since they were committing a crime occupying Baita Clarea. Abbà’s tragedy was not over at all. He had to wait 40 minutes to receive first aid cares and be transported by an helicopter to Turin’s hospital, although there were two ambulances at the building site. 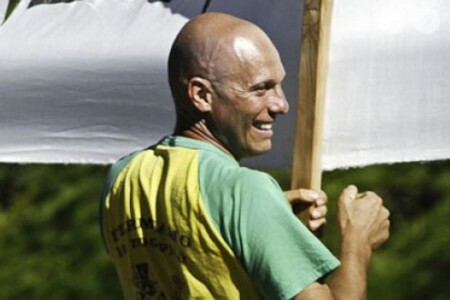 Alberto Perino, one of No Tav movement leaders, stated that the rescuers came extremely slow and late. Luca’s life is out of danger now, but doctors say that he has several trunk fractures, a lung puncture and a small head injury. The most important damages came from the electric shock, that caused deep burns, a vast internal bleeding and that could have severely hit some organs. Suddenly No Tav protesters occupied the highway and many Val Susa workers left the factories in solidarity with Abbà and his struggle. In the afternoon demonstrations took place in more that 60 Italian cities and even in Barcellona and Stuttgart. In Rome and Bologna the protesters occupied the train station’s tracks. At the end of the day in Val Susa the highway is still blocked by No Tav activists, some of them will spend the night in front of the hospital were Abbà is kept in a drug coma, while the TAV works, which didn’t stop for a moment – not even when Luca was laying unconscious waiting for first aid – are still going on. Related articles and more sources here.